After you have created an enrollment form, you'll need to share it with parents. How or when you would like parents to fill out the form is completely up to you. Depending on your enrollment process, you may want to share the form only after the parents have completed a few preliminary steps, or you may want to make this one of the first application documents they are to fill out to demonstrate interest in your program. In this article, I'll discuss two ways to share your enrollment form: by a simple hyperlink, or by embedding it as a button on your website. To get back to the "Share the Form" screen, you'll need to click on the "Edit Form" button in the upper right. From there, click directly on the #3 circle for "Share the Form." This will take you to the screen where you can find the link and button tools. Write the text that you want parents to click on. Copy the URL by clicking on the blue copy icon next to the form link (see image above). Highlight the text, then select the option to add a hyperlink and paste the URL in the link field. This is usually easier to read than if you were to list the entire link. However, if you're not sure how to create a hyperlink, simply pasting the entire URL is also perfectly fine. 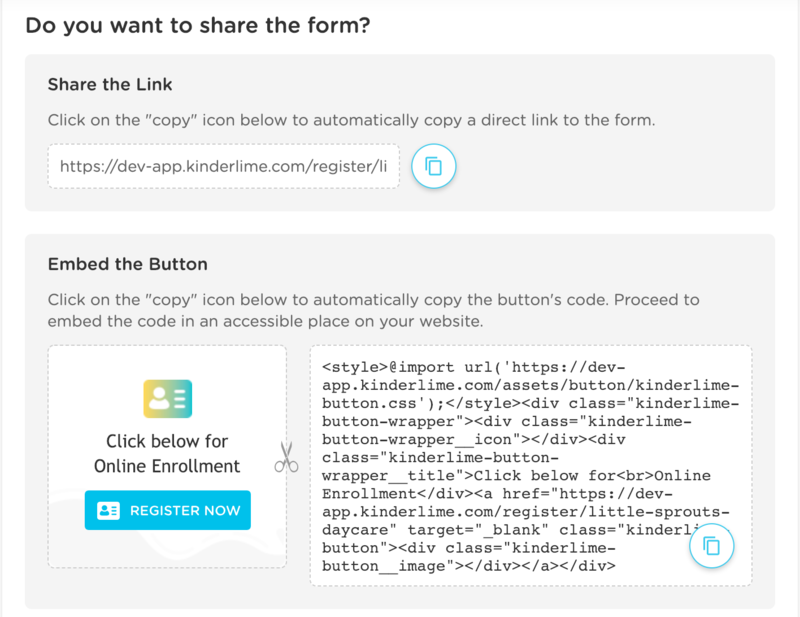 By embedding the form as a button on your existing website, interested parents can easily click to fill out their information and add themselves to your list of potential families on the Enrollment page of the Kinderlime website. Next, copy the button's code using the blue copy icon in the lower righthand corner of the code box (see image above). To use the button as-is, paste it into your website's HTML. However, if you would like to change the wording, you'll need to do so before or after pasting the code. You're also welcome to create your own button for your website if our pre-built one doesn't suit your needs.